You and your friends are trapped in a magical village after travelling miles to meet a wizard where legend has said to have special abilities and the secret to longevity. To escape, you must decipher the puzzles set by the wizard or be trapped forever. 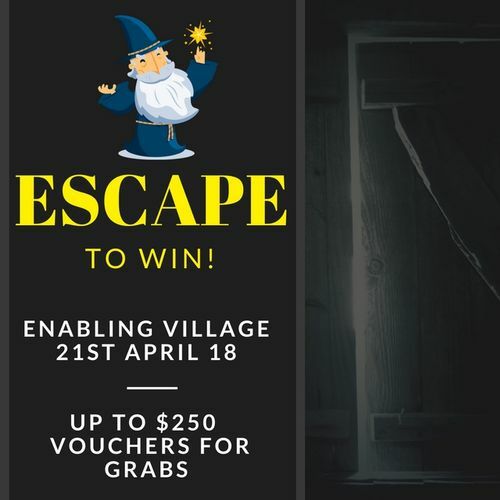 Will you be able to find the wizard and escape in time? Jio your friends and family to form a group of 4-6 pax and sign up at today! The Enabling Village is both a community and a space. It is a collective of individuals and organisations that serve—and are supported by—people with diverse abilities. Enabling Village's goal is to make it a place where people with different abilities can move independently; where they can feel accepted for who they are, and be valued for their contributions. Check out more information at the Enabling Village website. What's the Objective of this Escape? 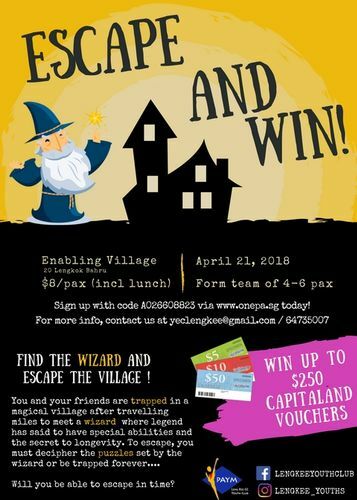 Escape @ EV is part of a public festival that Leng Kee YEC is organizing at Enabling Village. This is part of our Youthcare event. This event aims to raise awareness and acceptance towards people with disabilities and let public be more aware of Enabling Village as a space for both the able and people with disabilities.